ALL Links provided through your support & form ONLY downgrade the DATA plan!!! Provide the DIRECT URL to MANUALLY downgrade to BASIC FREE VOICE 200 MINUTE PLAN so customers can do this themselves, your site has EVERY option to "upgrade" but none to "downgrade". This is why many companies get sued and/or fined. Quit while you're ahead and make it clear and conspicuous in the same area as choosing plans! DO NOT WANT THIS UNLIMITED MINUTES & MESSAGES PLAN! WANT BASIC FREE 200 MINUTES VOICE PLAN + 500 TEXTS + 500 MB ONLY ALL AT NO CHARGE $0.00/MO!!! 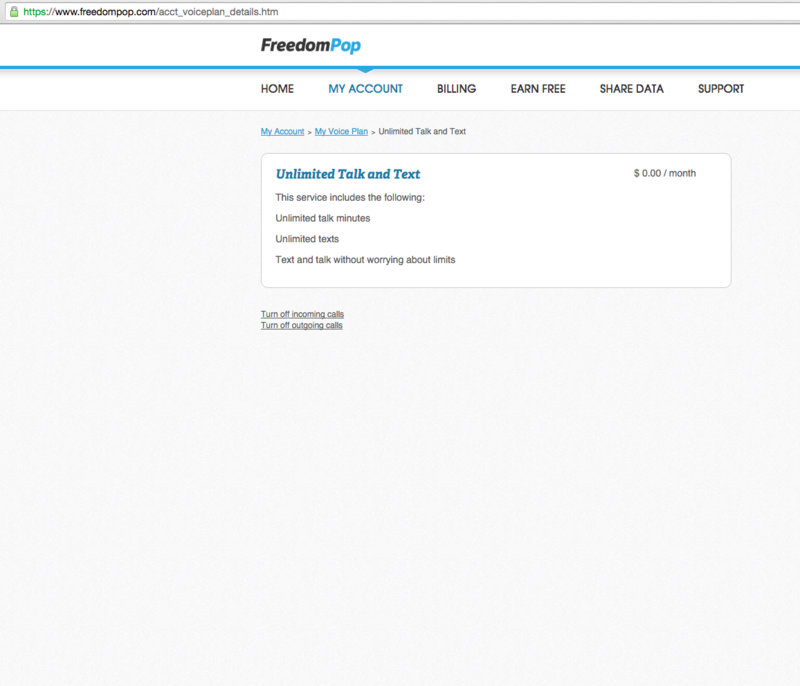 @fapa You realize that the unlimited plan you're on is free as part of a promotion right? It isn't part of a trial or anything, it's free forever. no im sorry but dont understand. i do not want to be charged anything just want the free voice text & data no more no less. i thought basic plan is/was 200 minutes talk & 500 texts. i don't want to be charge an additional $4.99/mo for voice/sms OR $15-19.99 for data either. just want a 100% FREE phone & service. please explain if i missed something just worried i will get charged something cant have charges appear on card or receive a bill. thank you! so what you are saying is there is no more such a thing as the 200 MINUTE TALK & 500 TEXT BASIC PLAN which has now been converted into an UNLIMITED TALK & TEXT FREE PLAN AT NO CHARGE $0.00 FOREVER??? I AM NEVER GOING TO GET A CHARGE FOR TALK & TEXT AND SINCE IM ON FREE 500MB DATA PLAN MY MONTHLY SERVICE IS ZERO DOLLARS AND ZERO CENTS??? Why does your website say 500 MIN TALK is $7.99/mo & UNLIMITED TALK & TEXT IS $10.99/mo but you're telling me its free for life??? can someone answer my questionS please??? but this option wasn't available in the beginning. if i decide to order a paid plan for a month or longer i dont want to go through all this trouble trying to get a hold of someone to do this for me. users should just have the option to do it themselves. there is NO option for users to downgrade their unlimited voice & text plans to the basic 200 min talk & 500 text free plan. others have reported in your forums they can't find it either. can you please just provide a direct link to do this by oneself? why is this so difficult to do? forum support contradicts what email support states which is why i just rather do it myself. i know how hard it is to get a hold of anyone (you're busy i understand) but as a customer i need to be able to change plans on demand by myself without assistance or intervention. please just provide a direct url to click and it automatically downgrades. if you can do it from your end customers should be able to ESPECIALLY because the welcome email states so HOWEVER the option does NOT exist! 1. Logging in your account. 4. Scroll down to see the Available plans. THESE IS NO OPTION TO CHOOSE FREE BASIC PLAN, the ONLY options are to UPGRADE AND PAY EXTRA $$$! Log into your account and try this link. This should bring up a box showing your current voice plan. At the bottom of the box in tiny letters your will see "To downgrade your plan, click here". Click on the here and a warning should come up about downgrading your plan. You will need to click on all the prompts that come up confirming that you want to downgrade your voice plan. What Ali told you is correct the voice plan you signed up for is Unlimited Talk and Text at the monthly charge of $0.00. You are never going to be charged for this plan, as long as you don't change to any other voice plan you'll never be billed for it. Yes, I still got the unlimited talk and text and 500mbs of data my second month for free.Awesome !